StrongDNS Review - Is StrongDNS Really Worth Your Money? Increasingly people across the world are using the internet to stream content they want to view. Popular sites such as Netflix and Hulu are practically extra TV channels and many such sites carry exclusive content. However, if you travel you will have noticed that geographical restrictions on content are becoming more frequent; this is where authorities in one country do not allow you to view content from others. Also, you may find copyright problems when viewing some content in certain locations. How do you get around this problem? One method is to use StrongDNS, a powerful and affordable software package that allows you to bypass these restrictions. 2 How Does Strong DNS Work? 3 Is StrongDNS a Virtual Private Network? 4 What Can I Use StrongDNS for? 5 How do I Set StrongDNS Up? 7 Do you need StrongDNS? Put simply, it’s a software program that enables your computer to overcome any geographical restrictions that you may find applied to content you are trying to access. For example, perhaps the most famous of these is the so called ‘Great Firewall of China’; this is a government-run initiative that precludes visitors to this commercially important country from accessing popular content from the west, especially that which is considered to be ‘subversive’. It’s important to note that it’s not on China that implements such restrictions: countries such as India, Indonesia and much of the Middle East also censor internet content to varying degrees. StrongDNS can help you get around these problems, so whether you are traveling for business or pleasure, you can still access your desire content without problems. In addition to those mentioned, sites that Strong DNS works for include the BBC, Vevo, CBS and ABC. How Does Strong DNS Work? When you access a website, wherever you are in the world, your computer includes in its address information on your location. All communication between computers uses servers – these are the machines that process the information and talk to each other in order to bring us the site we are asking for – and this is how geographical restriction work. If, say, you are in China and request banned content, you will do so via a server in China. This server will stop you from accessing the site, as it is programmed to do. StrongDNS works by effectively standing between you and the server in question. It does not use your address – the one that identifies you – but uses one that makes the system believe you are in a location where the content is permitted. Thus, you can easily access any content you want, wherever you are in the world. Is StrongDNS a Virtual Private Network? There are similarities between a Virtual Private Network (VPN) and Strong DNS, but they are not strictly the same thing. The major difference is that a VPN effectively creates a tunnel for all your online traffic, while StrongDNS is dedicated to overcoming geographical restrictions. The advantage of StrongDNS is that the user does not have to choose and change server locations – everything is done for you. What Can I Use StrongDNS for? Primarily, StrongDNS is intended for use by people who wish to access content that is blocked in either their home country or one to which they are traveling; the list of countries that block content is extensive, and includes many that are historically wary of western influence. Much of Africa is covered, plus countries such as Colombia in South America are heavily restricted. However, you may be surprised to find that many European countries impose restrictions: Italy, for instance, restricts access to some gambling sites – as does much of the USA. Internet censorship is changing in some countries as they move towards western ideals, but you will still find plenty of restrictions in popular holiday destinations such as Thailand. StrongDNS can only be used to access sites that are supported by the system, and it is worth remembering that many will require a subscription: Netflix, for example, Amazon and Hulu all require a paid account for all or some content, and StrongDNS does not overcome this necessity. Other sites that are supported include: NBC, FOX, MTV, Spotify and many UK and US channels. How do I Set StrongDNS Up? If you are not confident enough to tackle the above, use the automated process, or refer to the easy to understand help pages on the excellent StrongDNS website. StrongDNS can be installed on both PC and Mac; there are versions for all Windows operating systems from XP to Windows 8. For Mac, it is supported by OS and OSX, and it also runs on Ubuntu and Chrome. It can also be used on consoles including PS3, PS4 and XBOX 360, plus a variety of smart TV’s and both Android and Apple devices. 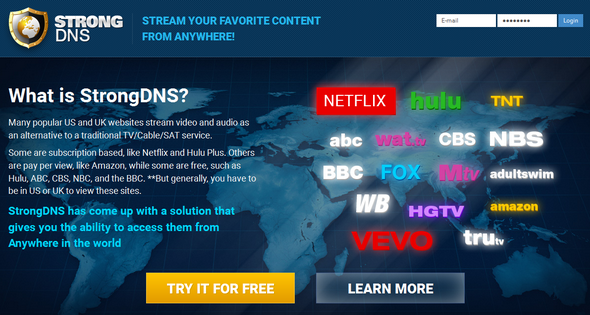 Without a doubt, StrongDNS – or a similar system – is vital for those who find they travel to countries where their desired streaming channels are not permitted. We found it easy to set up and use, and effective in all areas we looked at. Once you get used to the concept you will find you are no longer troubled by geographical restrictions and can browse freely and quickly, without interruption. StrongDNS is competitively priced, and we recommend that anyone interested takes up the free 7-day trial before purchasing. It may be worth also looking at alternatives: we have also reviewed the excellent Unlocator, which is very efficient, and also well priced. For StrongDNS you have a choice of various packages: a one month subscription is $5, or you can choose from three, six or one year packages, the latter a surprisingly affordable $50. (All prices correct at the time of writing.) There is plenty of information additionally on the website, along with a handy FAQ section that offers extra help and advice. While the world of internet censorship is undoubtedly changing, there are always going to be certain locations in which you are restricted in what you can stream. If you travel frequently you will find such a system to be essential in many ways, and if you live in a country where restrictions are in place you will also benefit from StrongDNS. Install it for the free 7-day trial and try it out; you may be surprised at the content available once it is up and running, and may discover sites that you never knew existed. Indeed, the full list of sites supported by StrongDNS is comprehensive, and can be found on the website. Software such as this, and Unlocator, is becoming very popular with users across the world who are unhappy at the way their permitted content is controlled, and will become part of everyday life once the many who have yet to head down this route choose to do so. We can’t recommend you try it out strongly enough.